If you want a customer notification solution that's fast, reliable and easy to use, Outbound Campaign Manager is the way to go. Outbound customer communications reduce inbound calls to live agents. Speed customer service for routine calls. They also make a statement about reducing contact center operating costs. In emergency situations, proactive notifications alleviate customer frustration. Targeted offers to opt-in customers demonstrate focus on revenue and sales. And personalized customer welcome messages, appointment reminders and satisfaction surveys say that you give a good CX about great customer care. What does your Notification solution say about you? If you want a customer notification solution that's fast, reliable and easy to use, Outbound Campaign Manager is the way to go. It allows you to instantly reach thousands of customers, with personalized voice, text, email and fax alerts for everything from account balances and flight delays to prescription refills, and more. Plus, you'll get 24x7x365 availability for emergency applications, as well. OCM requires no integration with your contact center PBX or ACD. And by combining OCM with our Actionable Analytics and Continuous Improvement Practice, you'll boost the productivity of your Contact Solutions IVR. Your job is to make sure your organization complies with regulatory requirements. Otherwise, key opportunities could pass you by. Whether you’re in healthcare, insurance or banking. Or your organization provides services to doctors, healthcare providers, hospitals or insurance companies, you'll have the confidence of knowing that your outbound customer communications meet state and federal regulations, with Contact Solutions. On the operations side, you’ll reap the benefits of reduced live agent call times, fewer re-authentications for callers, and less customer frustration. You also gain the capability to control notification start and stop times, and outbound/inbound call volumes with the click of a mouse. 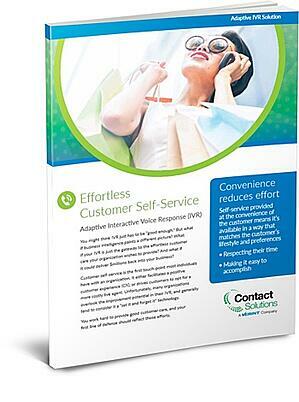 Download your free copy of the Effortless Customer Service eBook. 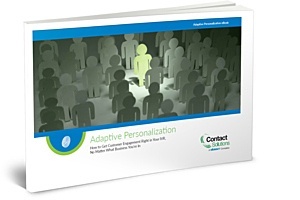 Download your free copy of the Adaptive Personalization eBook.